Within the Department of Arts Administration, Education and Policy, programs promote understanding of the arts and visual culture for students through a curriculum that is research-based, interdisciplinary and intent on collaboration with communities both within and outside the university, state, nation and world. We emphasize understanding of arts and culture, especially visual culture, in a global, culturally diverse and technological society. 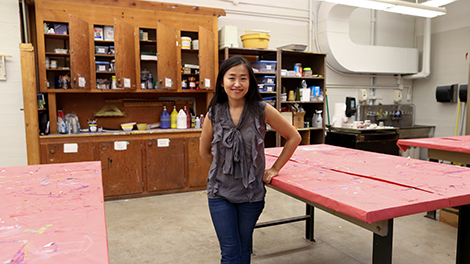 The four-year bachelor of art education (BAE) with licensure and BAE informal major prepare students for art teaching in schools, community-based settings and museums. Typically, the department admits 20-25 students into the program through a portfolio-based application. Students progress through a series of courses focused on educational theory, practice and art methods, and field based experiences. Once admitted to the major, students spend time in small classes taught by leading scholars in the field of art education. For more information visit the Department of Arts Administration, Education and Policy website or view the university's major curriculum sheet. Have a question about Art Education or want more information? Let us know. Many students are offered teaching positions prior to completing their student teaching practicum. Most find jobs in the greater Columbus area, but OSU teacher trainees are highly sought after because of our strong national reputation. Graduates are working in Arizona, New York, South Carolina, and other states, as licensure is transferable to 48 states. The Bachelor of Art Education (BAE) is an undergraduate degree designed for students who intend to become art educators in P-12 (pre-kindergarten through 12th grade) schools. While students interested in art education outside of P-12 may apply to the BAE program, current teaching shortages compel the department to preference students’ intent on teaching in schools. While the BAE degree with licensure prepares students to be traditional public school art teachers, students have also pursued careers in general education, museum education and curating. The department's most popular GE course, a second-writing that also fulfills social diversity requirements, students are introduced to a full range of critical analysis skills related to television. Developing strong writing skills and analytical thought are important components to this course's overall goals. We offer study abroad experiences in Chile, Ireland and Jamaica. Students travel with faculty and peers to engage with and explore art and culture through a variety of diverse settings. BAE students learn to advocate for the arts at both the state and national level, though travel to yearly conventions and by presenting research at conferences. The Department of Arts Administration, Education and Policy offers various awards and scholarships to its students.